There was yet another document that my mother needs to sign and have notarized as part of the process of winding up my late grandfather's estate. I've been unable to get down to her home in Dobbins, California for the past few weeks due to the snow. Today's conditions looked like the would (just barely) good enough to make it work. After (I thought) checking with her about this a few days ago, I headed across the mountains this morning after breakfast. Because of the uncertainty over the conditions, I backed for an overnight trip. I encountered rain and a little "wintry mix" at the very top, but other than needing to slow down for the wet and slick conditions, I was able to get over the top. I got to my mother's house at 1 PM, only to discover that she'd mistaken the date and thought it was next weekend. So I had her sign the papers that don't need notarizing, left her the one that does (I don't have to sign this one), and gave her an envelope to mail it to me. She'll send it to me as soon as possible. I hope to have it before I head off on the two-week trip I have planned starting a week from tomorrow. (And I can't easily pass through on my way to the Bay Area because I really do not want to take the Rolling Stone down the rough, steep, dirt roads in Dobbins. I can get the Astro over it, but I worry about the RV.) If not, we'll cope. I checked road conditions on I-80 and CA-20: no restrictions. So I decided to save myself $100 and skip overnighting at Grass Valley. I grabbed a burrito on the way and headed east. 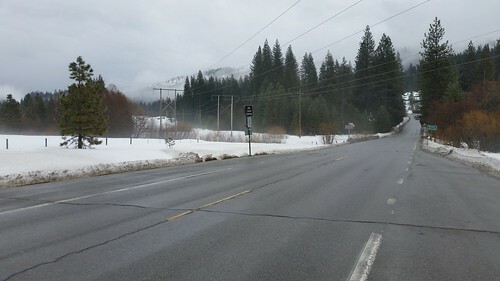 This turnout is on CA-20 at the crossing of the Bear River just before the road briefly crosses into Placer County and climbs up the ridge ahead to join I-80. At this point, I'd only encountered rain. As I climbed higher, the rain turned into mix, and after Kingvale, it started snowing. Over Donner Summit itself, it was snowing pretty heavily; however, it wasn't yet sticking. Signs warned of the 6% grade down to Truckee and advised 40 mph max. Me, I was happy to get behind a big rig going no more than 25 mph. I geared down and coasted behind him for several miles. It was still snowing a little bit at Truckee where I briefly stopped to get coffee, but thereafter it turned back into rain, which continued off and on until after Reno. I got home around 5:30 PM, which meant I was late for a Worldcon 76 division managers' conference call, but I'd warned the committee that there was a chance I would be late and I'd turned in my written report in advance. No harm done. Although the 340-mile round trip is tiring, I'm glad to be home tonight, and Lisa is also glad that I'm here.